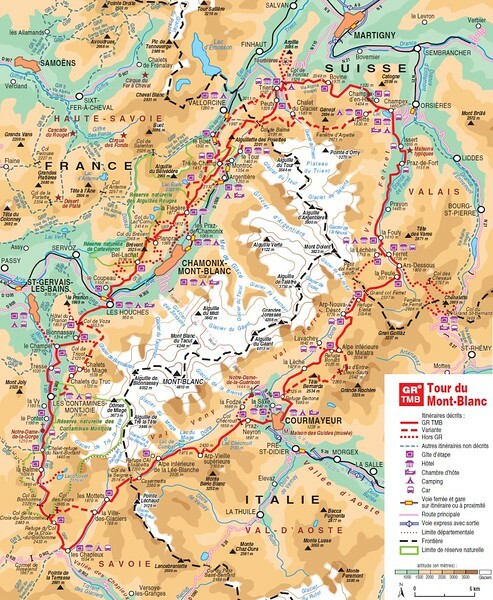 The Tour du Mont Blanc is a multiday (10 walking days in our case) trek that circumnavigates the Mont Blanc Massif, Western Europe’s highest mountain range. It is 170km (105 miles) in length and has in excess of 12000m (39370 feet) of ascent and descent (equivalent to one and a half times the height of Mt Everest). The route also passes through three countries, France, Italy & Switzerland.